Walk Behind Saw Rental – Core Cut – CC1900, is available for rent in Rochester NY, Ithaca NY and the entire Western New York region from the Duke Company. 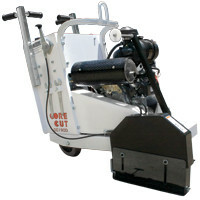 The Core Cut CC1900 early entry walk behind saw, available for rent, is featured by maximum cutting depth of 3.25 inches with a 14 inch blade, capable of .110 inches to .25 inch thick blades, electric actuator for raising and lowering of saw and skid plate and is gas powered. The machine features a lifting hook for transport.